If you’re in search of a best-in-class coffee machine, then breville bes870xl review is definitely going to helpful for you. So, just keep on reading to unleash a feature-loaded and affordable espresso machine. The Breville Barista Express BES870XL is equipped with lots of brilliant features so that you can relish the same super delicious coffee at your home. This amazing espresso machine has come with an integrated conical burr grinder along with dosing controls so that you can get ground fresh coffee in every cup. One of the best benefits is that you could grind coffee beans and dose straightforwardly into its coffee filter within less than 60 seconds. Flexibility and convenience are two main aspects of this coffee maker. Let’s check out some of the details elaborately in the coming sections. The BES870XL coffee machine is featured with a 15-bar pump along with a thermocoil heating system to streamline the process of brewing as well as frothing. You’ll also get the options of pre-programmed espresso through which you could make a single or double shot. This incredibly-designed coffee maker is equipped with a hands-free portafilter holder. You can choose the size of its filter (single or double) and keep this portafilter in place. This machine would automatically dose the appropriate amount of coffee. A button in the portafilter holder enables you to push once for having an auto dose or push and hold for manually determining the grind amount. This incredible coffee machine features 67oz removable reservoir and it also comes with a carbon resin water filter. That means you’d get clean water as well as superbly tasting espresso. The BES870XL has come with a commercial-style 360-degree swivel steam wand that is equipped with a brilliantly-designed stainless steel frothing attachment. You can make use of this attachment if you want to froth a large amount of milk unless you can use the steam wand for the daily uses. A newly-added feature is a dedicated hot water spout that’s absolutely perfect for preparing tea, americanos, or hot chocolate. 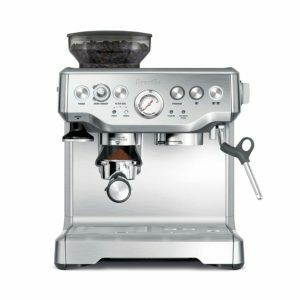 The Breville Barista Express holds an advanced brushed stainless steel finish. Owing to the button and knob-based controls, BES870XL has become an intuitive machine. Moreover, its pressure gauge, attached on its front panel, is simple as well as easy-to-read. As a whole, this coffee maker has designed to be a durable, robust, and user-friendly machine. Many of us wonder why our home-made coffee doesn’t taste the same as a coffeehouse one. There is no rocket science for your information. The reason is most of the automatic machines can dose only 11-13 g of ground coffee that’s not sufficient to produce a rich, lavish and full-bodied taste that we wish for. But, with BES870XL, you’d get 19-22 g dose for full flavor. That means a delicious cup of coffee in your comfort zone. Even a small difference in temperature (33.8° F) can make a big difference in the tastes of espresso (the difference between ashy and balanced tasting espresso). Luckily, the Breville Barista Express has come with an Infuser that makes use of digital temperature control (PID) technology. It is meant to detect and lower any type of fluctuation throughout the extraction that makes sure the temperature is maintained at its optimum range every time. Want to create a golden honey cream in your coffee? Actually, it needs the correct pressure at the right time. The Infuser of Breville Barista Express employs low pressure and pre-infusion so that the ground coffee can be soaked and expanded. You’ll get a creamy and sweet extraction as a result. If you want to have a velvety texture in your milk, perfect steam pressure is needed for drawing in the air and creating a number of tiny bubbles. With BES870XL, you don’t need to worry at all! Its manual steam wand is designed for the Infuser that could convert your milk into a lavish, silky smooth micro-foam that’s a requirement for latte art. It’s true that Breville has provided extensive effort to make the design and performance of BES870XL a top-notch quality, but some of its features, including hot water dispenser, should be improved. This coffee maker can work well itself but it needs careful maintenance. Even skipping some cleaning sessions can make its grinder loud. As the Breville Barista Express has come in comparatively taller in size that means you have to check out its dimensions before purchasing it so that it can fit well in your kitchen. In simple words, Breville BES870XL Barista Express Espresso Machine is an ideal coffee maker if you want to relish luxurious coffee treats in your comfort zone. It’s perfect for home use – approx 20 cups of espresso/day. I hope breville bes870xl review was helpful for you in making your purchasing decision. Buy this affordable and feature-loaded coffee maker today!